Holmes for the Holidays was a success. On behalf of the PTO and the families of Holmes Elementary School, we wanted to extend our thanks to all of the staff, family and friends who came out to support the Holmes for the Holidays Fair on Dec. 3. You all helped make the fair a rousing success, and you supported a worthy cause! The Holmes community offers Fairway Market a heartfelt thanks for its wonderful fresh food and products, stellar service and the benevolence with which they responded to our request for contributions to our Reindeer Cafe. We'd specifically like to thank all the local businesses who so generously donated to our auction: Abode, American Girl, Any Random Jane, Art and Soul, Backstreet Restaurant, Barrett Bookstore, Baubles, Beadworks, Beadz Boutique, Bedford Jewelers, Ben & Jerry's, Benefit Cosmetics, Blue Line Sports, Blue Ribbon General Store, BMW of Darien, Bobby Valentine's Sports Academy, Booktopia Fairs, Boston Ballet, Brandman's Paint, Brasita's, Bridgeport Bluefish, Bridgeport Sound Tigers, Brooks Brothers, Burgers, Shakes and Fries, Cafe D'Azur, Cafe Manolo, Camp Bow Wow, Camp Playland, Candy Nichols, Cesco's Trattoria, Caricatures by Domenico, Charlie and Grace, Christine Simmons, Chunky Pam's Sweet Shoppe, Coco Nail, Cole Haan, Costco, Crystal Rock, Curtain Call, Darien Animal Hospital, Darien Carpet, Darien Diner, Darien Doughnut, Darien Ice Rink, Darien Sports Shop, Darien Toy Box, Darien YMCA, Darien/Rowayton Bank, David Harvey Jewelry, DiMare's Pastry Shop, Disney ABC Domestic Television, Doggie Doo Not, Dolce Nails and Spa, Downunder Kayaking, Dr. Christine Hamilton-Hall, Dynamic Martian Arts Family Center, Eastern Mountain Sports, Elements Yoga, Empire State Building, EOS, Erika K, Everything is Rosey, Fairway, Flair Fitness, Frederic & Co., Fuji of Japan, Fun Craft, Gail's Stride Rite, Garden of Eve, Gardener's Center & Florist, Ginger Bitz, Giuliano's Music Center, Glen Liquor, Go Figure, Gofer Ice Cream, Goldenberry, Good Food Good Things, Good Goods, The Goose, Great Play, Green Mountain Coffee Roasters, Grieb's Pharmacy, Gut Reaction, Harriett Beecher Stowe Center, Heart of Gold Fine Jewelry, Heights Pizza, Helen Ainson Shoppe of Darien, Hotel Zero Degrees, House of Needlepoint, Imperial Cleaners, In a Jar Foods, Infinity Fitness, Itty Bitty Bag, Jack Dog Studio, Jade Nail & Spa, Jake's Place, JAM, Jane Adams Jewelry, Jeffrey Friedberg and The Bossy Frog Band, JGD Seaside Delights, Joan Carruthers Photography, Johnny's & Company, Kempo Academy of Martial Arts, Kennedy's, Kids U, Krazy Kool Lego Creations, Lake Compounce, Landfall Navigation, Lanphier, Learning Express, Legend of the Game, Let's Dress Up, Little Gym, Long Ridge Camp, Lucille Khornak -- The Portrait Specialist, Manhattan Theatre Club, Mead Farm, Megan Dey Photography, Moe's Monkey, Mohawk Mountain, Mohegan Sun, My Three Sons, New Canaan Eye Associates, New Wave Seafood, NFL, Nicholas Roberts Fine Wines, Nick's Pizza, Nielsen's Florist, Noroton Heights Fire Department, Okemo, Palmer's Market, Park Animal Hospital of Darien, Past and Presents, Pedal and Pump, Peggy Garbus Photography, Phil's Grill, Phoenix Trading, Post 53, Red Door Spa, Regency Limo, Reynolds Farms Nursery, Ring's End, Rip Van Winkle, Robek's, Rory's, Brendans 101, Rowayton Pizza, Rudy's Limousine Service, Runner's Roost, Sails, Sanda's Cleaners, Scena, Seasons Too, Senator Bob Duff, Sharkey's Cuts for Kids, Shiki Japanese Restaurant, Shippan Tennis, Silhouettes by Andrea Peitsch, Simply Irresistable, Ski Sundown, Skirtin Around, Sono Fieldhouse, Soundview Millworks, Spa Grace, Sparky's Adventures, Spectacles, Splash Car Wash, Spree, Springdale Florist & Greenhouse, Stamford Symphony, Stamford Twin Rinks, Stampin' Up, Stella and Dot, Stepping Stones Museum, Steve Demasco's Shaolin Studios, Stew Leonard's, Stop & Shop, Sunny Nails, Swizzles, Sylvan Learning Center, Take Shape, Tasti D Lite, Ten Twenty Post, The Batter's Box, The Compleat Angler, The Depot, The Hopkins Inn, The Maritime Aquarium at Norwalk, The Mark Twain House & Museum, The Pawprint Market, The Sugar Bowl, Tiger Shulmann's Karate, Trade Joe's, Treasured Keepsakes, USTA, VAS Construction, Vineyard Vines, Vinny's Backyard Restaurant & Bar, Walt Disney World Co., Walter Schalk School of Dance, Westport Country Playhouse, Whole Foods, Wild Birds Unlimited, Williams & Company and Zamboni's Pizza. We greatly appreciate your support and you helped make the event truly a success! Thank you to our boutique vendors for coming in to sell your beautiful things, we appreciate your support at our Fair! Thank you to Simply Irresistable, JGD Seaside Delights, Itty Bitty Bag, Andrea Peitsch Silhouettes, Soundview Millworks, Any Random Jane, Charlie and Grace, Jane Adams, Phoenix Trading, Gingerbitz Design, Moe's Monkeys, Chunky Pam's Sweet Shoppe, Caricatures by Dom, Treasured Keepsakes, Darien Toy Box and In a Jar Foods. You all did an incredible job! Thank you to all of our volunteers who dedicated so much time and effort toward making our school a beautiful winter wonderland, who worked tirelessly preparing food, soliciting donations, running the crafts and games, running the auction and cleaning up. Thank you to Bob Carita for building an amazing sleigh for Santa to sit on! 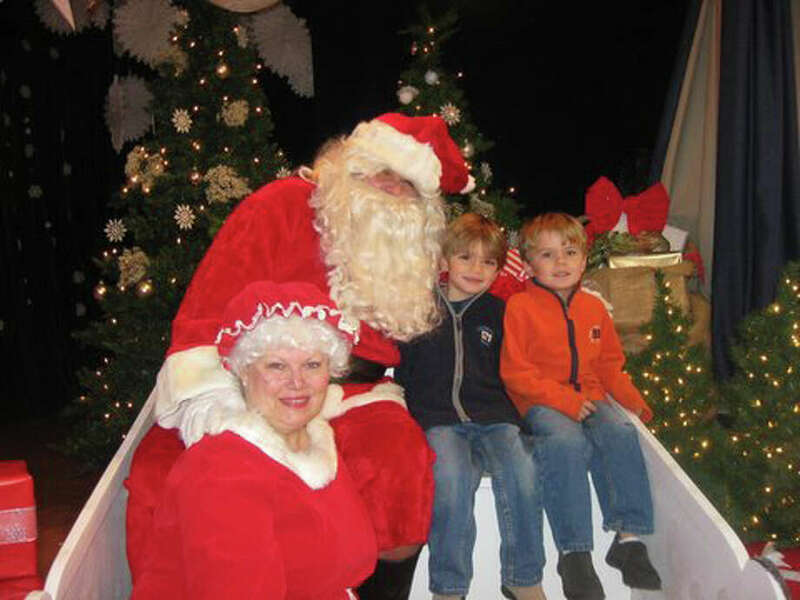 Thanks to Santa, Mrs. Claus and our three buddy elves for stopping by during this busy holiday season. Finally thank you to our administration and custodial staff who helped so much before and after the event, we couldn't have done it without you. Your dedication is truly appreciated. Holmes for the Holidays was a huge success and we sincerely appreciate everyone that contributed to it.